Ginny is Death’s daughter, a reaper of vengeance. She rides through the West on a horse made of smoke, her face tattooed with her heritage, and deals in revenge. She is the mysterious, elusive center of PRETTY DEADLY, the first creator-owned comics series by acclaimed writer Kelly Sue DeConnick (Captain Marvel, Ghost, Osborn) and artist Emma Ríos (The Amazing Spider-Man, Osborn), coming from Image Comics in October. 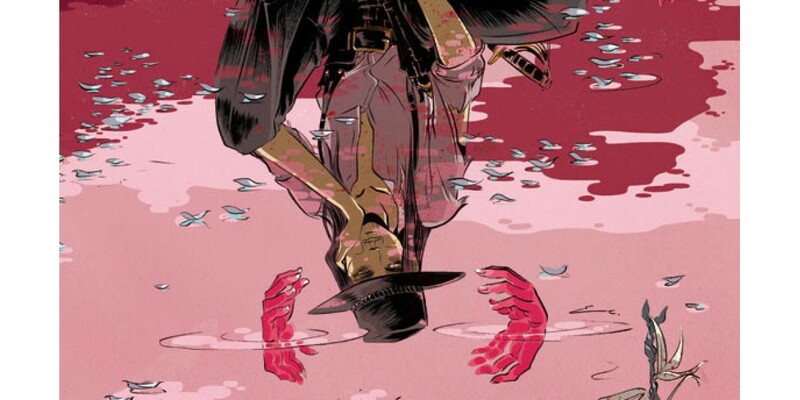 Simultaneously beautiful and savage, PRETTY DEADLY will unfold over the course of an ongoing story that DeConnick and Ríos developed together, creating a world and characters that are entirely their own. At the same time, DeConnick and Ríos say, it’s almost as if PRETTY DEADLY has a will of its own that guides the action. Having worked together on Marvel’s Osborn, DeConnick and Ríos found common ground in their love of Westerns and Japanese cinema for PRETTY DEADLY. DeConnick was inspired by spaghetti westerns, Japanese “pinky violence” films, and Grimm’s fairy tales, while Ríos found her visual language for the series by absorbing both Westerns and samurai films. Colorist Jordie Bellaire (THE MANHATTAN PROJECTS, NOWHERE MEN) maintains the earthy, dusty atmosphere of the art, as well as the magical tone of the story, thanks to a subdued palette punctuated with bursts of vivid color. The first issue of an ongoing series, PRETTY DEADLY #1 will be in stores on October 23 and can be pre-ordered from the August issue of Previews (AUG130504).